If you had a childhood like mine, you likely remember a bright red drink being your beverage of choice. Kool-Aid is a classic for many kids but it’s really not all that kid friendly. The main concern in this ingredient list is the food dyes. There are a few other ingredients that’s I’d rather not see (artificial flavor?!) but the main reason natural parents avoid Kool-Aid is usually the food dyes. Why? Because food dyes have been linked to hyperactivity. There’s a reason why your kid would bounce off the walls and act like a wild animal after having a glass of this stuff! In addition to the above ingredients, you are supposed to add 1 cup of sugar to make 2 quarts of Kool-Aid. 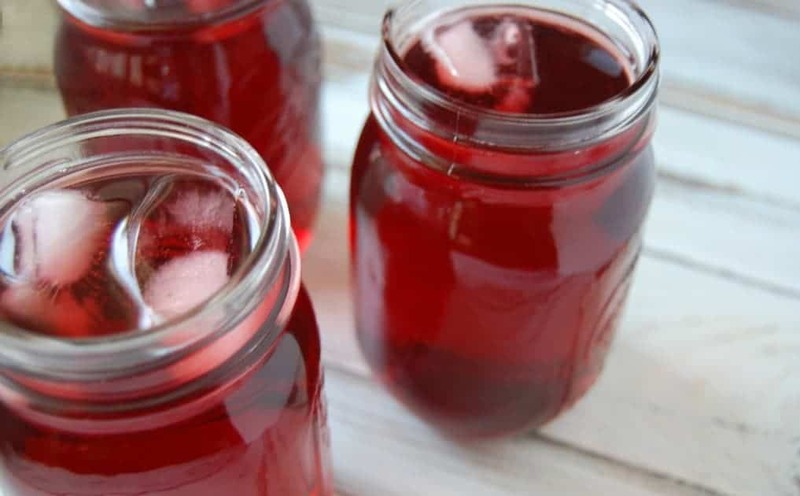 That is 2 tablespoons per cup of this bright red beverage! Kids do not need added sugar to their diets. Nobody actually needs added sugar to their diets! Sugar can cause tooth damage, hyperactivity, decreases the immune system and a whole host of other issues. Of course, Kool-Aid does offer the suggestion of adding Splenda instead of sugar as their healthy alternative to sugar but Splenda is just as bad or worse in my opinion since it’s hardly natural! What’s a parent to do when they want to give their child something to drink that’s fun? 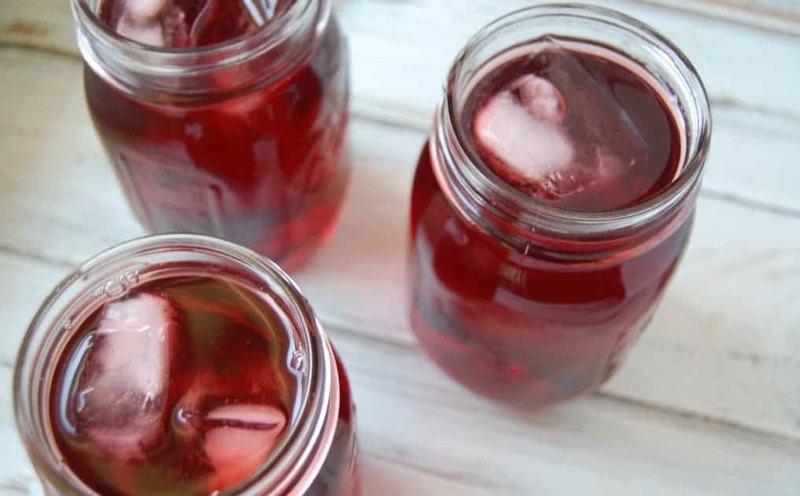 You make a homemade kool-aid alternative! I came up with this herbal tea because I wanted to let my kids have a fun drink but also because it’s beneficial to them! Truth be told, it originally came about because one of my kids is a smidgen low in iron levels and so I had her drinking dandelion leaf tea. So not only is my 3-2-1 Tea a fun drink for kids but it’s going to actually benefit their bodies as well! 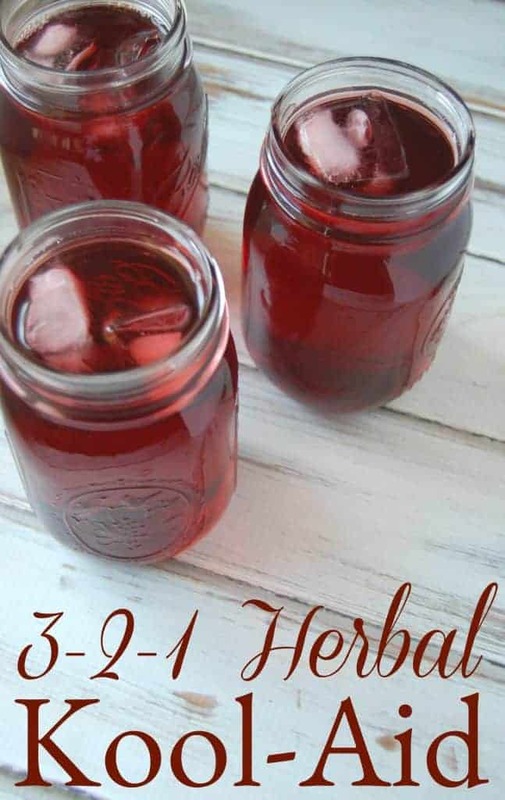 What’s in this homemade Kool-Aid alternative and why is it called 3-2-1 Herbal Tea? These flowers are what gives this tea it’s Kool-Aid like color and tartness. Hibiscus is more than just show however, it’s also a great source of Vitamin C and has high levels of anti-oxidants. A word of caution though, apparently hibiscus is often grown with peanuts and thus sometimes parts of peanuts can turn up in hibiscus! So if there is a severe peanut allergy; it’s best to avoid hibiscus or buy hibiscus that is peanut free. As I hinted above, dandelion leaf is high in iron levels this makes it great for helping iron levels get to where they need to be. It also has very high vitamin K levels which is great for blood clotting. On top of it all, dandelion leaf is a great purifier of the blood, kidneys, and liver. These are the fruit of roses. They are a great source of vitamin C. Rosehips help boost the immune system which all kids can benefit from and it helps with iron absorption. I like to keep things simple and as I was adjusting this recipe, I realized that all I needed to do was remember 3-2-1 for my recipe. There are three herbs in this tea, one has 3 tablespoons, one has 2 tablespoons, and the last has 1 tablespoon. Just 3-2-1 and you’re done! Ok so you aren’t quite done. I do add stevia at the end because otherwise this tea wouldn’t be very much like Kool-Aid. It does need a bit of sweetness. I love using stevia because it’s calorie free with none of the scary side effects that many sugar substitutes have. However, if you aren’t a fan of stevia then feel free to sub in your sweetener of choice; you’ll want to use roughly 4 tablespoons of your alternative choice however. Place 4 cups of water in small saucepan and bring to just under a boil. Add in all ingredients except for stevia. Let steep for at least 20 minutes but longer is okay as well. Strain tea and pour liquid into a 2 quart container once cooled. Add in stevia and stir/shake to thoroughly mix. Finish filling container with cold water. Love the 3-2-1 idea. This tea looks great and I bet adults like it too! Could I use nettle leaf instead of dandelion leaf? Yes you definitely could! Nettle is definitely a popular favorite and it's great for allergy relief. I choose dandelion leaf just because it's higher in vitamin K and iron than nettle. Saw the post about going natural: wondering where the posts are? The link on Homestead Blog hop 76 is not correct. Links to nothing. I found the article: Going Natural One Month at a Time, but it was only the initial article: Where are the rest? Noted it came out in Jan of 2015. Thanks! Thanks for the recipe! I’m always looking for healthy alternatives for my grandkids! What a great idea for a healthy alternative to the chemical Kool aid. This recipe is filled with health and would be so great for kids and adults too. Thanks for sharing on Real Food Fridays. Pinned & tweeted! I love this idea! I’m baby-stepping toward more natural products and this looks amazing. Now to find a good source for the ingredients. Thanks for sharing at the Healthy Living Link Party! I totally love the idea of something refreshing without a ton of sugar and artificial stuff. Love this recipe! I’ll be featuring it today over at Savoring Saturdays linky party. I hope you’ll come back and join us. I knew a lovely west indian lady who made a drink like this from sorrel, sweetened with a little sugar and served chilled with ice. Very pleasant, and refreshing. And I understand that sorrel has great antioxidant properties. Really a win, win. This recipe doesn’t use sorrel. I found hibiscus is a great thirst quencher and helps in cooling you down in the heat of summer. I actually found it in a tea from of all places, a gas station! It was an organic honey sweetened tea, and I just made it myself with hibiscus flowers at home…voila! It also had some Yerba Nate in it, but I thing the dandelion would be a great alternative or additive! I love this idea! I grew up drinking kool-aid not realizing all of the harmful ingredients in it. I am so glad I can now enjoy childhood memories with better ingredients. Yippee! !